A print firm that went into insolvency 18 months ago has been turned into a £420,000 turnover business with a 12 percent operating profit by its owners, with the help of Action Coach. 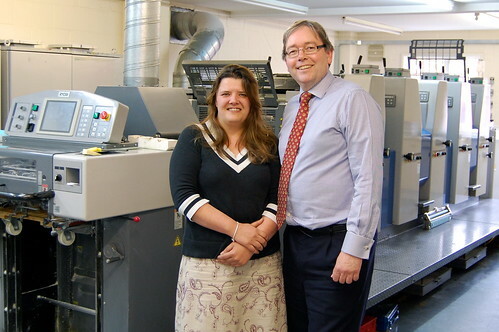 Litho printers Hulbert & Woodall of Wootton Bassett was started by former production manager Hayley Woodall and ex-printer and luthier Pete Hulbert. Five redundant staff members were re-hired, and the directors are now looking to invest in equipment and even offer apprenticeships to young people from the town. Hayley, who had no previous experience of running a business, was helped on the road to success by Marlborough-based business guru Nigel Scott, of Action Coach – and the pair are celebrating the first anniversary of their business partnership. Nigel, who was introduced to Hayley through Business Link, helped her to understand the nuts and bolts of running a business – from the legal aspects of employing staff to understanding her market place and customers, generating new sales leads, and measuring the performance of the company. Hayley, who worked at Hulbert Press for eight years before it closed, said: “It was my first directorship and quite daunting. Nigel has introduced a structured approach to running the business. Everyone in the organisation knows what the targets are, which has developed a great team spirit as well as improving sales and increasing profits. The company prides itself on its local, personal service, which Hayley reckons has helped Hulbert & Woodall fend off competition from cheaper internet competitors. “Our customers know they can come in and talk to us, work with our designer, and collect their completed job direct from the print works,” said Hayley. Nigel said: “Hayley, like a lot of people in her position, has a very busy life. We meet once a fortnight, and I help her to improve the business for herself, her staff and her customers. I encourage her to spend some of her time working on the business, rather than all of her time working in it. Hulbert & Woodall can be found at Unit 16, Templars Way Industrial Estate, Marlborough Rd, Wootton Bassett, SN4 7SR and contacted on 01793 853849.